At one time, Central Park was full of litter and graffiti. Steel drums served as trash receptacles. Garbage and recycling trucks crossed onto lawns and pedestrian paths to reach the overflowing bins. The Park is an incredibly different place now. Our 42 million annual visitors cherish the Park as an inviting oasis ― free of litter ― in the middle of the most populated city in the U.S.
That’s not because visitors produce less waste. In fact, we remove approximately 2,000 tons of trash and 1,800 tons of recyclables each year. So how does the Conservancy manage so much trash and recycling, while remaining open 365 days a year? Efficiently, with the help of our successful trash management and recycling program, launched in 2013. We promote a “carry in, carry out” philosophy. In other words, we remove as much trash from inside the Park as possible. Beginning with Sheep Meadow in 1980, we’ve removed trash cans from the interior of landscapes and placed them on nearby paths, drives, and the Park’s perimeter. This reduces vehicular traffic related to trash collection, which protects the Park’s landscapes and keeps visitors and Conservancy staff safer. We’ve continued to reduce the number of locations throughout the Park where trash receptacles can be found. Without trash to feed on, the number of rats found in the Park has dropped considerably. And without rats to compete with for food, chipmunks have returned to Central Park (look for them in the Ramble and North Woods) ― a big win for preserving the Park’s biodiversity! Our staff collects trash 17 hours per day. Field staff members start each day with trash pick-up as their top priority. They remove trash and recycling, empty receptacles, and inspect their area of the Park. Trash collection truck operators cover the Park from 7:00 am to midnight. By continuing trash pickup late into the evenings, early-morning staff members have less trash to collect and more time to maintain our beautiful landscapes ― planting shrubs and flowers and caring for our lawns, among many other tasks. In January, we introduced a new fleet of 52 electric carts for garbage collection to replace our gas-powered carts. Quieter, with no emissions, these new carts help to make our waste management even cleaner and greener. Our sleek receptacles are aesthetically pleasing ― and practical. In 2013, we installed more than 700 garbage and recycling receptacles which were specifically designed and patented for Central Park. A major upgrade from those old steel drums, these receptacles are designed to remain outdoors year-round while hampering rodents’ ability to climb inside. They are also made from partially recycled aluminum, and their one-of-a-kind design was inspired by the slats of Central Park’s benches. Our receptacles are popping up around the country. Planners in Sacramento’s Handle District recently ordered 18 of the same trash and recycling cans found in Central Park. 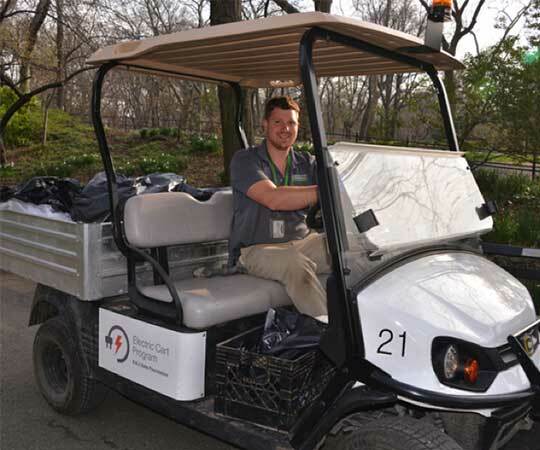 We share our trash management practices with parks around New York City and the world. Trash management is a big issue in all public areas, not just Central Park. Now that we’ve developed and implemented a successful plan, we’re excited to share it with others through our Institute for Urban Parks, the Conservancy’s educational arm. Our Five Borough and Park-to-Park programs share our best practices and urban park management expertise with parks locally, nationally, and globally. We recently provided hands-on trash management training for staff at Crotona Park in the Bronx. 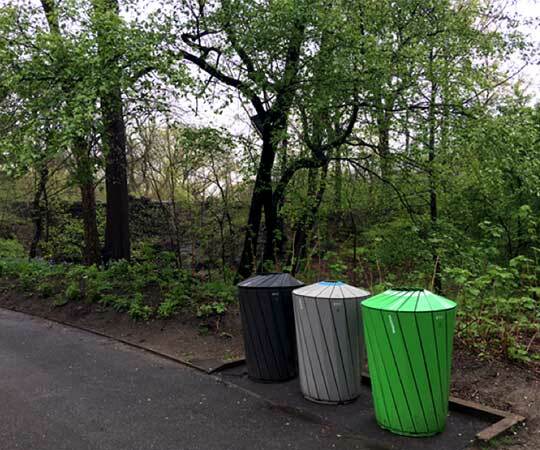 After adopting many elements of our trash management system, Crotona Park’s visitor satisfaction improved by 65%. Our visitors have a hand in keeping the Park clean, and without your help, it wouldn’t be possible to maintain the Park’s beauty. 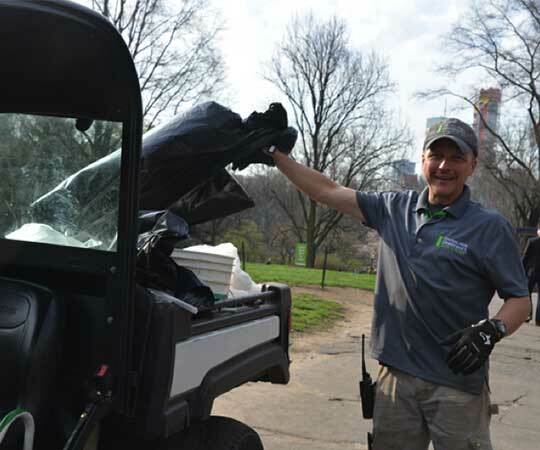 Whether you actively “carry in, carry out,” or keep the Park clean as a volunteer, we’re thankful for your partnership.